BRIGHT Researcher, Nonhlanhla Mbatha (right) was awarded a PhD for her work on virus types in rural young women that may cause cancer. High-risk human papillomavirus infections occur frequently in young women. The available vaccines cover up to seven high-risk-HPV types and two low-risk types. Amongst 1223 rural young women of KwaZulu-Natal 301 (25%) were positive for hr-HPV. The nine predominant genotypes in descending order were HPV types 16 (22 %), 51 (13 %), types 18 (13 %), 35 (11%), 33 (11%), 56 (9 %), 45 (8 %), 52 (7 %) and type 59 (7 %). The types HPV 35, 51, 56 and 59 – representing as many as 40.62% of the dangerous viruses, are not covered by any vaccine. These types were among the most prevalent in the young women of KwaZulu-Natal. This poses an important hurdle in the fight against cervical cancer and new vaccines should be developed. 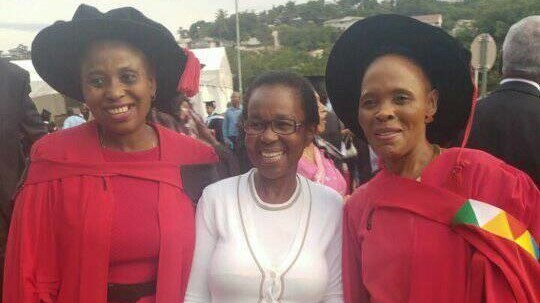 We congratulate Dr Mbatha and her main tutor (Dr Zilungile Kwitshana, left) with the eminent work.